Understanding why some nations turned to étatism in the early stages of economy building remains central to political economy. A general consensus, although it comes in different versions, holds that étatism became the developmental policy in nations where indigenous entrepreneurial classes were weak and small. Traditional accounts of Turkish turn to étatism in the 1930s generally draw on this premise. This article challenges these perspectives that associate étatism with a strong state and a weak entrepreneurial class. I argue that the turn to étatism in Turkey did not simply result from the developmental shortcomings of the newly emerging private sector. The state's own shortcomings at governing the newly emerging class of self-interest seeking entrepreneurs, and instituting order in the markets was a major factor. BASAK KUS. 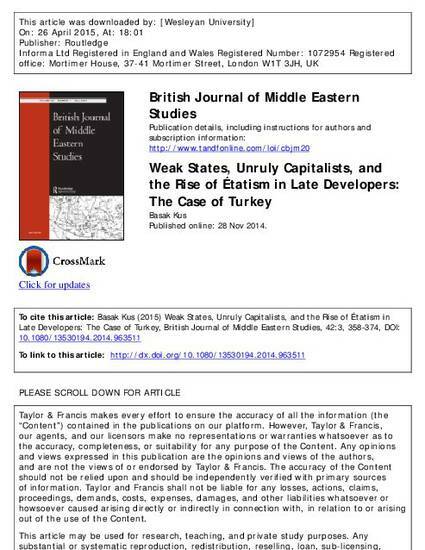 "Weak States, Unruly Capitalists, and the Rise of Étatism in Late Developers: The Case of Turkey" British Journal of Middle Eastern Studies (2015).